The button itself is pretty slick. It has a self-adhesive strip on the backside so it can easily be placed wherever is most convenient such as a pantry or the refrigerator (I recommend placing it out of the reach of small kids to prevent order mishaps). Before ordering, it has to be set up with your phone's Bluetooth and the Amazon app, which is not a challenging process. Once set up, an order can be placed with just a press of the button. The button costs $4.99, but upon placing the first order, a $4.99 credit is applied to reduce the price (one time only). An indicator light turns green for a successful order or red for an unsuccessful one. At any time, you can check on the status of or cancel your order through your Amazon Prime account, as with any other Amazon order. Each button correlates to one product, so you will have to choose one of Enjoy Life Foods' many options to pair with your button (see all of the pair-able items here). 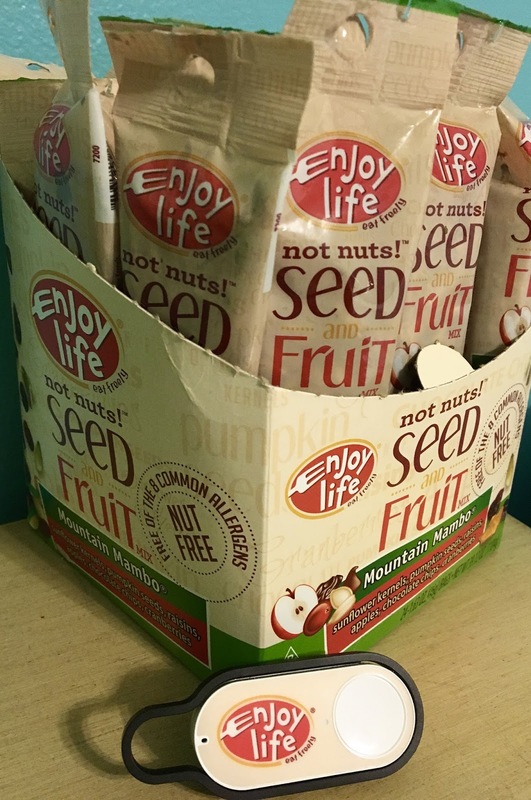 For my trial, I selected the 24-pack of individually sized mountain mambo seed and fruit mix, which is something I can't find on local store shelves, and will definitely come in handy when the fall semester starts up in a few weeks. Once the order was placed, my order came in a speedy two days, which definitely made me feel like I was glimpsing the future of shopping. 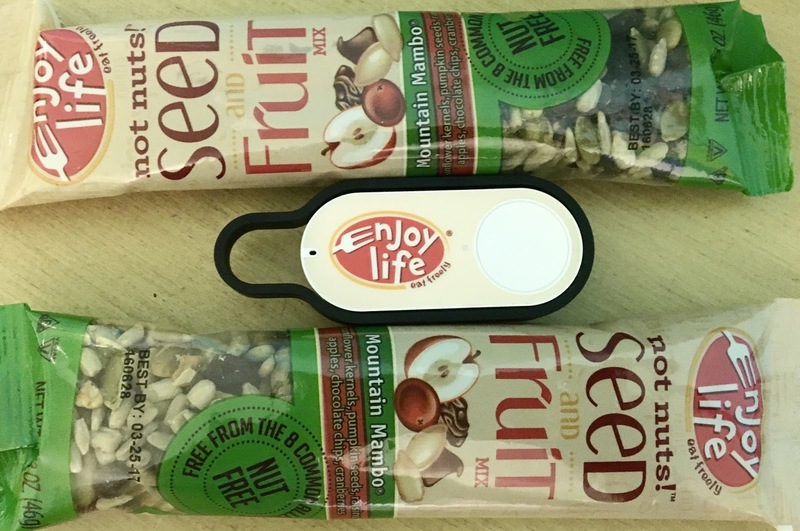 Thanks to the Amazon Dash button, I can take one more thing off my lengthy shopping list, and can always have Enjoy Life Foods' items in my pantry whenever I need a snack I can toss in my backpack for a full day of work, classes, and internship. While I chose the seed and fruit mix as the paired item for my button, you could choose Enjoy Life Foods' cookies, baking mixes, chocolate chips, or whatever product you use most on a regular basis, which makes keeping allergen-free fare in the house effortless. Disclaimer: This review is current to the original publication date. Updates will be noted. Ingredients and manufacturing processes can change without notice. Each product should be reviewed for individual nutritional needs. Feel free to to contact me with any questions or comments. 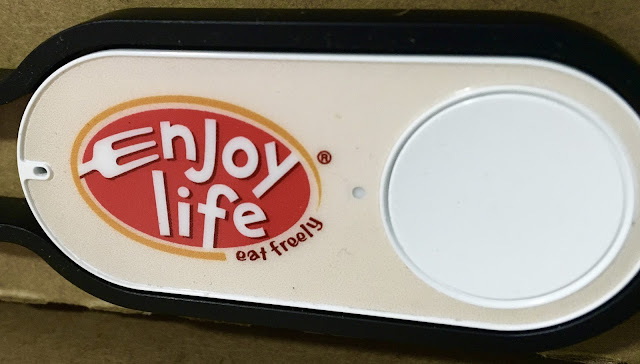 Enjoy Life Foods sent me a Amazon Dash button to review, but I am independently an Amazon Prime member. My purchase was not complementary, and all opinions are my own.